Amsterdam, Munich, Utrecht and Barcelona are Europe’s most lucrative cities for European real estate investors, yielding total returns on investment of over 14%. The market for investments into real estate is heating up, and while attractiveness will remain in 2018 and 2019, income returns are expected to slow down and stabilise at around 4% to 5% annually. Research by Sweco Capital Consultants, an advisory offshoot of engineering consultancy Sweco that specialises in real estate and infrastructure investments, shows that cities in the Netherlands have in 2017 surfaced as Europe’s prime when it comes to returns on commercial real estate. 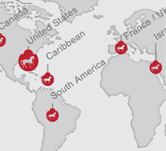 The country hosts four of the top 10 cities identified – led by capital city Amsterdam (16.4%), followed by Utrecht (14.2%), The Hague (12.3%) and Rotterdam (11.2%). “Overall, 2017 was a great year for investors in European real estate, with a total return of 9.3% for the Eurozone, up from 7.9% in 2016. Return figures were fuelled by economic growth, low interest rates and investor confidence, and driven by real estate appreciation,” said Saskia van den Bronk, Head of Sweco Capital Consultants. Among the top 5 best performing cities in Europe are Munich (16.1%) – hot on the heels of Amsterdam, and two Spanish cities; Barcelona (14.1%) and Madrid (13.6%). 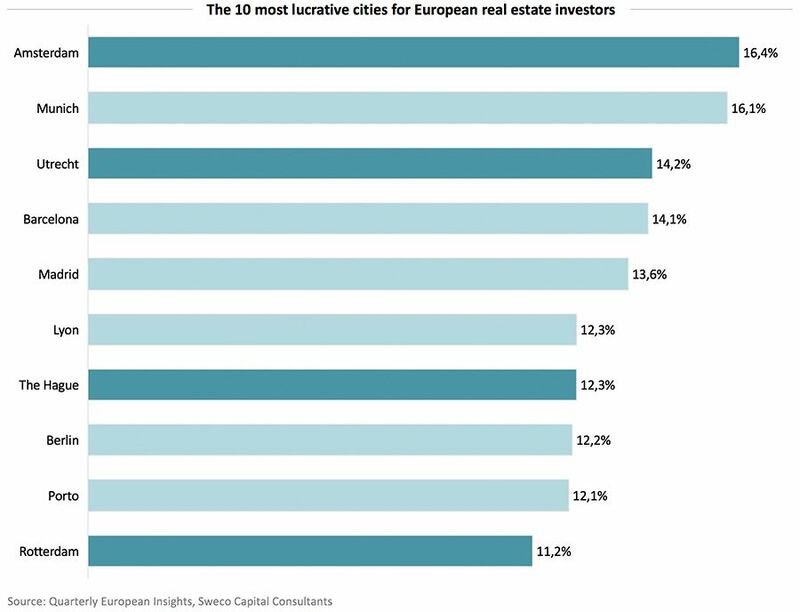 Closing the top 10 of Europe’s most lucrative cities for real estate investors are Lyon (12.30%), Berlin (12.20%), and Porto (12.10%). In the UK, where the real estate market is traditionally more volatile, especially in the politically instable environment following Brexit, the total return, measured in local currency, rose to 9.6% in 2017 from a meagre 3.9% in 2016. Neither London nor Manchester however made the top 10. For the coming two years, the researchers expect that the European real estate market will remain attractive from a return perspective, with income return forecasted to stabilise at around 4%-5% annually. On the back of the market’s sustained growth, total capital raised will increase. As it stands, the UK and Germany are the most liquid markets for fundraising: UK volume on a trailing twelve-month basis as of Q1 2018 hit €75.7 billion, followed by Germany’s €57.4 billion. In comparison, investors in France, Europe’s third largest economy, raised €26.5 billion, although still significantly more than their counterparts in Spain (€13.8 billion) and the Netherlands (€19.8 billion). Investments in the residential/multifamily, logistics and hotel sectors in the main metropolitan areas in Europe are touted to provide the most robust investment opportunities.